The University of Kansas (KU) is a public research university and the largest in the U.S. state of Kansas. KU branch campuses are located in the towns of Lawrence, Wichita, Overland Park, Salina, and Kansas City, Kansas, with the main campus located in Lawrence on Mount Oread, the highest location in Lawrence. Founded March 21st, 1865, the university was opened in 1866, under a charter granted by the Kansas State Legislature in 1864 following enabling legislation passed in 1863 under the Kansas State Constitution, adopted two years after the 1861 admission of the former Kansas Territory as the 34th state into the Union following a very famous bloody internal civil war known as "Bleeding Kansas" during the 1850s. The university's Medical Center and University Hospital are located in Kansas City, Kansas. 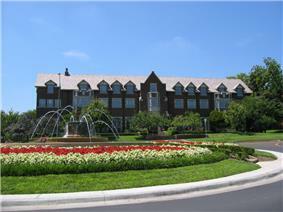 The Edwards Campus is in Overland Park, Kansas, in the Kansas City metropolitan area. There are also educational and research sites in Parsons and Topeka, and branches of the University of Kansas School of Medicine in Wichita and Salina. The university is one of the 62 members of the Association of American Universities. Enrollment at the Lawrence and Edwards campuses was 23,597 students in fall 2014; an additional 3,371 students were enrolled at the KU Medical Center for a total enrollment of 26,968 students across the three campuses. The university overall employed 2,663 faculty members in fall 2012. ^ a b "KU Info: When Was KU Founded?". Retrieved 2014-04-22. ^ "College and University Endowments, 2013-14". http://www.chronicle.com. Retrieved 30 January 2015. ^ "Board of Regents Announce 2015 Fall Semester Enrollment" (PDF). Topeka, Kansas. 25 September 2015. Retrieved 25 September 2015. ^ "KU primary & secondary color palette". University of Kansas. March 20, 2015. Retrieved March 20, 2015. ^ "Supply Chain & Logistics Education at School of Business". Retrieved 12 October 2014. ^ a b c d "Kansas: A Cyclopedia of State History". ^ a b "University of Kansas Profiles:Net Registration Head Count Enrollment" (PDF). Retrieved 2013-11-07. ^ "University of Kansas Profiles:Faculty and Staff FY2013" (PDF). Retrieved 2013-11-07. ^ "History of KU - Kansas Historical Society". Retrieved 12 October 2014. ^ a b c Griffin, C.S. "The University of Kansas and the Years of Frustration, 1854–64". Retrieved 2009-12-04. ^ "History of the Jayhawk Battalion". ^ a b c d "University of Kansas - Overall Rankings". Colleges.usnews.rankingsandreviews.com. Retrieved 2013-11-07. ^ "How the University of Kansas rates" (PDF). Office of Institutional Research and Planning. 2013-09-13. Retrieved 2013-11-07. ^ "Academic Ranking of World Universities 2015: USA". Shanghai Ranking Consultancy. Retrieved August 15, 2015. ^ "Best Colleges". U.S. News & World Report LP. Retrieved September 10, 2015. ^ "2015 National Universities Rankings". Washington Monthly. n.d. Retrieved September 17, 2015. ^ "Academic Ranking of World Universities 2015". Shanghai Ranking Consultancy. 2015. Retrieved August 15, 2015. ^ "QS World University Rankings® 2015/16". Quacquarelli Symonds Limited. 2015. Retrieved September 15, 2015. ^ "World University Rankings 2015-16". THE Education Ltd. Retrieved October 1, 2015. ^ "KU Architecture Ranked No. 14 in DesignIntelligence Rankings, No. 1 in Midwest". sadp.ku.edu. 2012-11-08. Retrieved 2013-11-07. ^ "KU Business History". Retrieved 12 October 2014. ^ "KU in KC region". Retrieved 12 October 2014. ^ "James Green Hall". Retrieved 12 October 2014. ^ "Tradition". Retrieved 12 October 2014. ^ "Hearst Foundation national writing competition". Retrieved 12 October 2014. ^ "About KU Edwards Campus". Retrieved 2013-11-07. ^ "Costs and Scholarships - KU Affordability". Affordability.ku.edu. Retrieved 2015-03-28. ^ "Early Lynx". Retrieved 2009-09-07. ^ "Phog Allen founded NCAA Tournament". Retrieved 12 October 2014. ^ "Sheahon Zenger". Retrieved 12 October 2014. ^ a b "KU Debate". Retrieved 12 October 2014. ^ "NDT Winners". Retrieved 12 October 2014. ^ "School Songs". Retrieved 12 October 2014. ^ "2006 Award Winner Reviews ~ Kansas Authors Club". Retrieved 12 October 2014. ^ "Welcome from the Dean". Retrieved 12 October 2014. ^ "KU Student Housing". KU Office of Student Housing. Retrieved June 30, 2014. ^ "McCollum". Retrieved 3 July 2015. ^ "KU Memorial Unions website". Retrieved 12 October 2014. ^ "KU Endowment". Retrieved 12 October 2014. The Community Tool Box is a public service of the University maintained by the Work Group for Community Health and Development. It is a free, online resource that contains more than 7,000 pages of practical information for promoting community health and development, and is a global resource for both professionals and grassroots groups engaged in the work of community health and development. The first union was built on campus in 1926 as a campus community center. The unions are still the "living rooms" of campus today and include three locations – the Kansas Union and Burge Union at the Lawrence Campus and Jayhawk Central at the Edwards Campus. The KU Memorial Unions Corporation manages the KU Bookstore (with seven locations). The KU Bookstore is the official bookstore of KU. The Corporation also includes KU Dining Services, with more than 20 campus locations, including The Market (inside the Kansas Union) and The Underground (located in Wescoe Hall). The KU Bookstore and KU Dining Services are not-for-profit, with proceeds going back to support student programs, such as Student Union Activities. The University of Kansas has had more teams (70) compete in the National Debate Tournament than any other university. Kansas has won the tournament 5 times (1954, 1970, 1976, 1983, and 2009) and had 12 teams make it to the final four. Kansas trails only Northwestern (13), Dartmouth (6), and Harvard (6) for most tournaments won. Kansas also won the 1981–82 Copeland Award. Notable non-varsity sports include rugby. The rugby team owns its private facility and internationally tours every two years. KU football dates from 1890, and has played in the Orange Bowl three times: 1948, 1968, and 2008. They are currently coached by David Beaty, who was hired in 2014. In 2008, under the leadership of Mark Mangino, the #7 Jayhawks emerged victorious in their first BCS bowl game, the FedEx Orange Bowl, with a 24–21 victory over the #3 Virginia Tech Hokies. This capstone victory marked the end of the most successful season in school history, in which the Jayhawks went 12–1 (.923). The team plays at Memorial Stadium, which recently underwent a $31 million renovation to add the Anderson Family Football Complex, adding a football practice facility adjacent to the stadium complete with indoor partial practice field, weight room, and new locker room. KU's academic computing department was an active participant in setting up the Internet and is the developer of the early Lynx text based web browser. Lynx itself provided hypertext browsing and navigation prior to Tim Berners Lee's invention of HTTP and HTML. Tuition at KU is 13 percent below the national average, according to the College Board, and the University remains a best buy in the region. KU's Edwards Campus is in Overland Park, Kansas. Established in 1993, its goal is to provide adults with the opportunity to complete college degrees. About 2,100 students attend the Edwards Campus, with an average age of 32. Programs available at the Edwards Campus include developmental psychology, public administration, social work, systems analysis, information technology, engineering management and design. The University of Kansas Medical Center features three schools: the School of Medicine, School of Nursing, and School of Health Professions. Furthermore, each of the three schools has its own programs of graduate study. As of the Fall 2013 semester, there were 3,349 students enrolled at KU Med. The Medical Center also offers four year instruction at the Wichita campus, and features a medical school campus in Salina, Kansas that is devoted to rural health care. The William Allen White School of Journalism and Mass Communications is recognized for its ability to prepare students to work in a variety of media when they graduate. The school offers two tracts of study: News and Information and Strategic Communication. This professional school teaches its students reporting for print, online and broadcast, strategic campaigning for PR and advertising, photojournalism and video reporting and editing. The J-School's students maintain various publications on campus, including The University Daily Kansan, Jayplay magazine, KUJH TV and KJHK radio. In 2008, the Fiske Guide to Colleges praised the KU J-School for its strength. In 2010, the School of Journalism and Mass Communications finished second at the prestigious Hearst Foundation national writing competition. In the U.S. News & World Report’s America’s Best Colleges, 2014 issue, KU’s School of Engineering was ranked 45th among public schools nationwide. National rankings for individual programs included Petroleum Engineering at ninth and Aerospace Engineering at 33rd. Automotive programs such as the Jayhawk Motorsports and the KU Ecohawks are popular design teams operating for years on campus. The University of Kansas School of Law was the top law school in the state of Kansas, and 68th nationally, according to the 2014 U.S. News & World Report "Best Graduate Schools" edition. Classes are held in Green Hall at W 15th St and Burdick Dr, which is named after former dean James Green. Named one of the best business schools in the Midwest by Princeton Review, the KU School of Business has been continually accredited by the Association to Advance Collegiate Schools of Business (AACSB) for both its undergraduate and graduate programs in business and accounting. 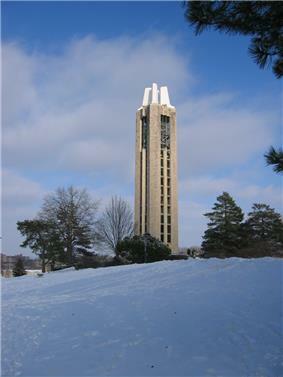 According to the journal DesignIntelligence, which annually publishes "America's Best Architecture and Design Schools," the School of Architecture and Urban Design at the University of Kansas was named the best in the Midwest and ranked 11th among all undergraduate architecture programs in the U.S in 2012. The University of Kansas School of Architecture, Design, and Planning (SADP), with its main building being Marvin Hall, traces its architectural roots to the creation of the architectural engineering degree program in KU's School of Engineering in 1912. The Bachelor of Architecture degree was added in 1920. In 1969, the School of Architecture and Urban Design (SAUD) was formed with three programs: architecture, architectural engineering, and urban planning. In 2001 architectural engineering merged with civil and environmental engineering. The design programs from the discontinued School of Fine Arts were merged into the school in 2009 forming the current School of Architecture, Design, and Planning. The city management and urban policy program and the special education program are ranked first in the nation by U.S. News & World Report's "America's Best Graduate Schools" among public university programs. It also recognized several programs for ranking in the top 25 among public universities. In its 2015 list, U.S. News & World Report ranked KU as tied for 106th place among National Universities and 50th place among public universities. The University of Kansas is a large, state-sponsored university, with five campuses. KU features the College of Liberal Arts & Sciences, which includes the School of the Arts and the School of Public Affairs & Administration; and the schools of Architecture, Design & Planning; Business; Education; Engineering; Health Professions; Journalism & Mass Communications; Law; Medicine; Music; Nursing; Pharmacy; and Social Welfare. The university offers more than 345 degree programs. KU is home to the Robert J. Dole Institute of Politics, the Beach Center on Disability, Lied Center of Kansas and radio stations KJHK, 90.7 FM, and KANU, 91.5 FM. The university is host to several museums including the University of Kansas Natural History Museum and the Spencer Museum of Art. The libraries of the University include the Watson Library, Spencer Research Library, and Anschutz Library, which commemorates the businessman Philip Anschutz, an alumnus of the University. The 2014 U.S. News & World Report rankings listed KU as 101st in the category "national universities" and 47th among public universities. The U.S. News & World Report "Americas Best Graduate Schools" rankings have ranked 49 KU programs since 2008, 35 of which are ranked in the top 40 among public university programs. 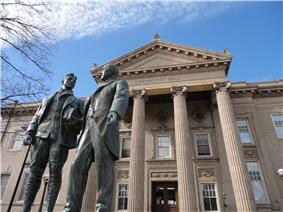 The university opened for classes on September 12, 1866, and the first class graduated in 1873. Work on the first college building began later that year. The school's Board of Regents held its first meeting in March 1865, which is the event that KU dates its founding from.